On a global scale the USA has the largest concentration of rich people. This wealth is not shared with its poor population. 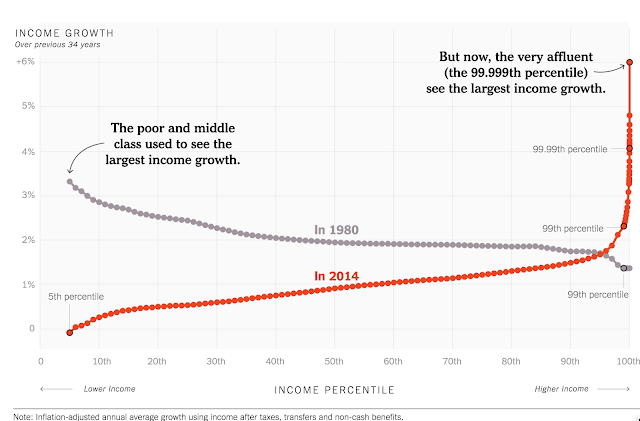 Income growth rates have changed significantly in the last 35 years. The poor and the middle class in the US used to see large growth in their income, as shown by the percentiles of the entire population in the chart below. That has changed by 2014, which is the last time this data is available. Recently the very affluent (e.g. 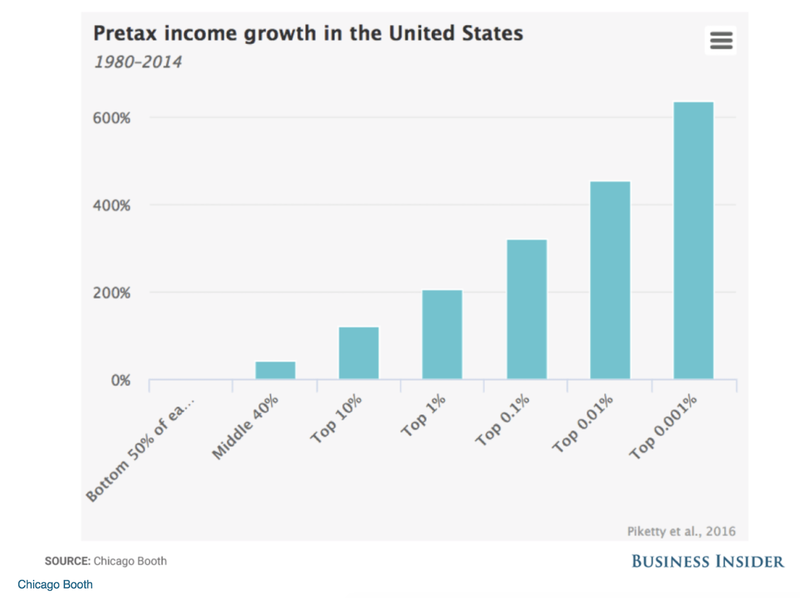 the "ultra rich"), who are above the 99th percentile of the entire US population, have seen the largest income growth. 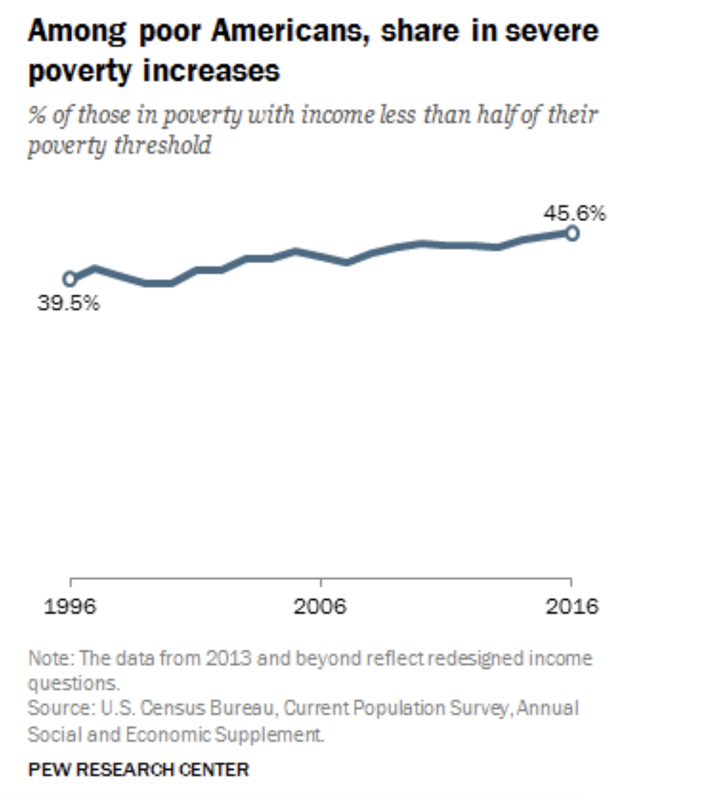 While the income of the top 1% kept rising, the percentage of people living in poverty kept increasing from 1996 through 2016 from 39.5% of the total population. The Federal poverty threshold is the measurement of poverty in America. The U.S. Census Bureau uses it to report how many Americans live in poverty each year. The poverty threshold is used for statistical purposes. In 2016 a single head of a household over the age of 65 was defined as earning $11,511/year. The share of total US wealth held by the top 1% of families increased from 34% of total wealth of families in 1962 to 40% in 2016. During the same period the wealth holdings of the bottom 90% of families declined from 34% of wealth in 1962 to 22% in 2016. 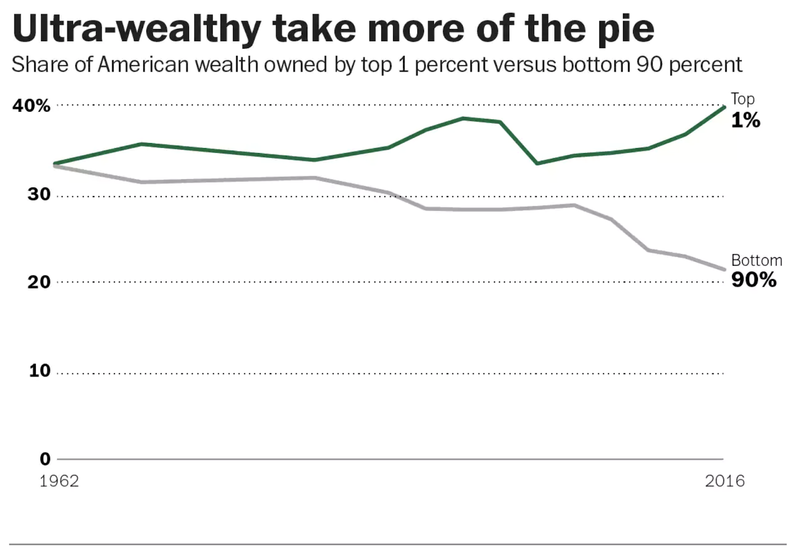 The disparity in wealth kept increasing, with the greatest gap created after about year 2000. Among rich nations, the United States stands out for its inequality of wealth. 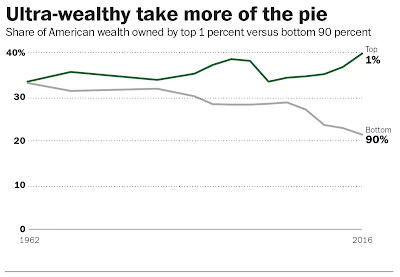 The top 1 percent in the U.S. own a much larger share of the country's wealth than the 1 percent elsewhere. The ownership of the American top 1 percent is twice as large (40 percent) as the 1 percent in France, the U.K., or Canada. It is more than three times as much as the 1 percent in Finland. Featured in a recent source from the University of Chicago's Booth School of Business, the above graphic highlights just how the income growth has been for the very wealthiest Americans — and how stagnant, in contrast, have been the wages for the rest. In 2017, there were about 126.22 million households in the United States. According to the U.S. Census Bureau, a household consists of all the people who occupy a housing unit. This suggests that in 2017 there were 7.5% of millionaires (9.4 million millionaires of a total of 126 million families) and 1% (1.3 million ultra-rich of a total of 126 million families) of ultra-high new worth families in the US. The rich families therefore offer a large market for high priced homes and luxuries that one can find in most publications sold only to the rich. The huge accumulations of wealth in the USA have not been distributed but has become increasingly concentrated. As long as such increases in aggregate wealth continue on the current course there will be a overall society will be able to maintain social cohesion. When the sources of global wealth, largely enabled from financial dominance, will cease to be sustained, rifts in the social fabric can be expected to emerge. What is the extent and timing of such dissolution is not as yet apparent. If you are unable to find a personal trainer, you can look into the konsorts website. It has many options to choose from. All you will need to do is get a membership from it and get your service.